The Women on Top (WOT) Theatre are at it again! A three month project exploring women’s identity and voices through the visual and performing arts is coming to an end and we want you to celebrate the journey with us! 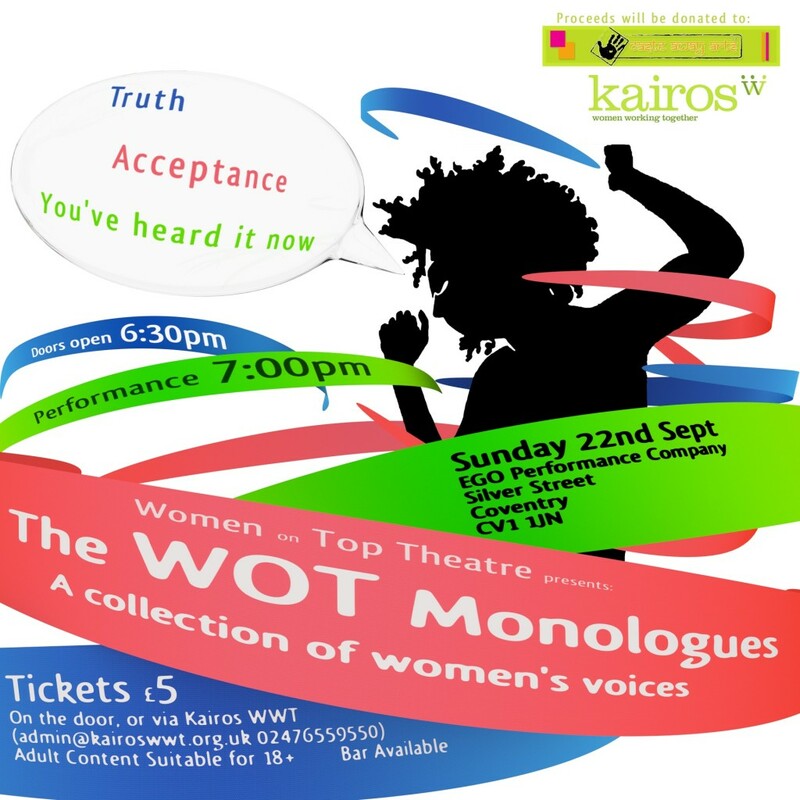 Kairos WWT and Caste Away Arts have been working in partnership since 2011 to offer women in Coventry a platform to have their voices heard. On Sunday 22nd Sept, 6.30pm at Ego Performance Company, Women on Top Theatre will be bringing you an original collection of monologues, celebrating women’s voices. It promises to be a great evening of entertainment with special guests from the Women’s Drama Group, Poplar, London. We will also be exhibiting a collection of large scale self-portraits created by service-users, volunteers and staff at Kairos WWT, celebrating women’s hope, strength and resilience. If you would like to come and support this event, you can book tickets direct from our Big Give Page (£5 donation required), by contacting Kairos on admin@kairoswwt.org.uk 02476559550 or on the door on the 22nd.